Save the library file into a folder, we’ll refer to this folder as LIB_FOLDER. 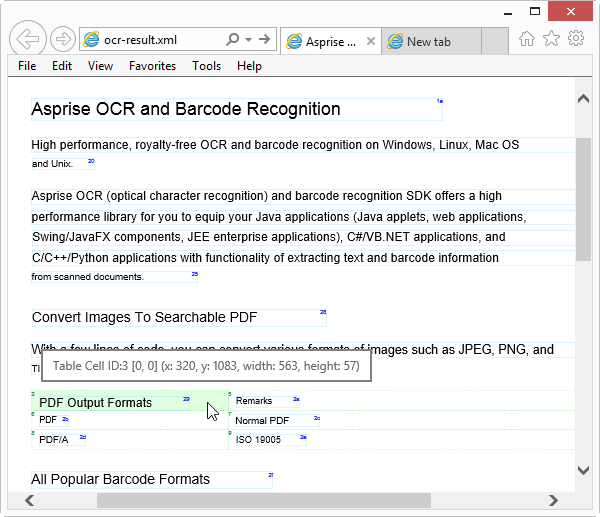 Note: If you’d like to try out the OCR engine without programming, we offer ready-to-use demo UI application for Java, C#, and Python. // CHANGE TO THE ACTUAL PATH to the input image, can be jpeg, gif, png, tiff or pdf. // finally, stops the OCR engine. Line 2: Imports the OCR functions and constants. c_com_asprise_ocr_start creates a new OCR engine that recognizes English in fastest speed setting; The evaluation version is able to recognize English (eng), Spanish (spa), Portuguese (por), German (deu) and French (fra). For other languages, please contact us. The list of languages supported can be found Languages Supported. 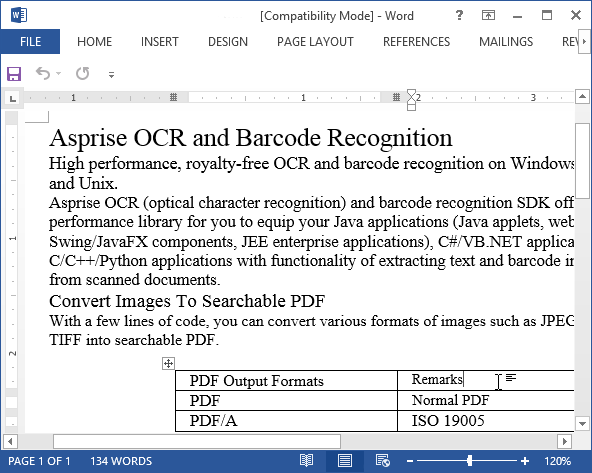 c_com_asprise_ocr_recognize performs OCR on the given input image. 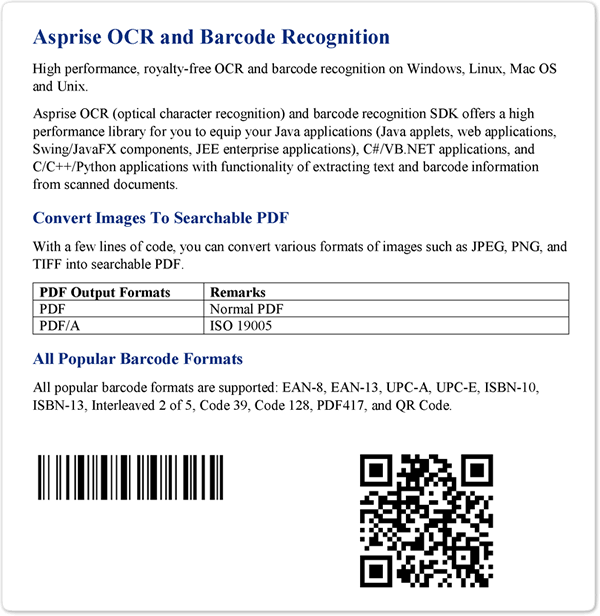 In above code, it recognizes all the characters and barcodes from the image and output to a PDF file. Additionally, plain text format of the recognition result is returned. 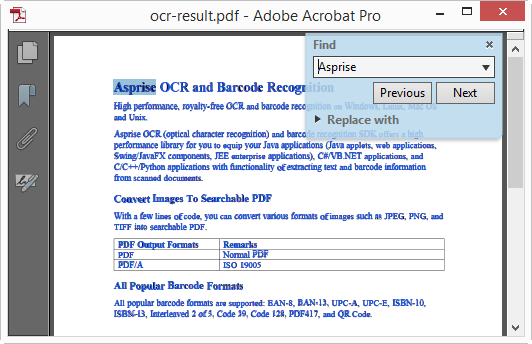 Asprise OCR supported the following output formats: plain text (Ocr.OUTPUT_FORMAT_PLAIN_TEXT), XML (Ocr.OUTPUT_FORMAT_XML), searchable PDF (Ocr.OUTPUT_FORMAT_PDF) and user editable RTF (Ocr.OUTPUT_FORMAT_RTF). In above code, properties are specified in a single string separated by | (with key and value separated by =). When you use multi-threading, keep in mind that each thread must have its own dedicated OCR engine instance.